Feeding My Family would like your help in boycotting North West Company (NWC) owned retailers and service providers located in Nunavut, Northwest Territories, Yukon, Alaska and southern Canada. We are asking you not to shop in any North West Company stores or use any of their service providers on Saturday January 31, 2015. Retailers owned by North West Company are; NorthMart, Northern, Giant Tiger, Quickstop, Valu Lots, Solo Market, Price Chopper, Cost-U-Less and Alaskan Commercial (AC) Value Stores. Wholesale and Services include: We Financial and Crescent Multi Food. Feeding My Family is about raising awareness of the high cost of food in the northern regions. 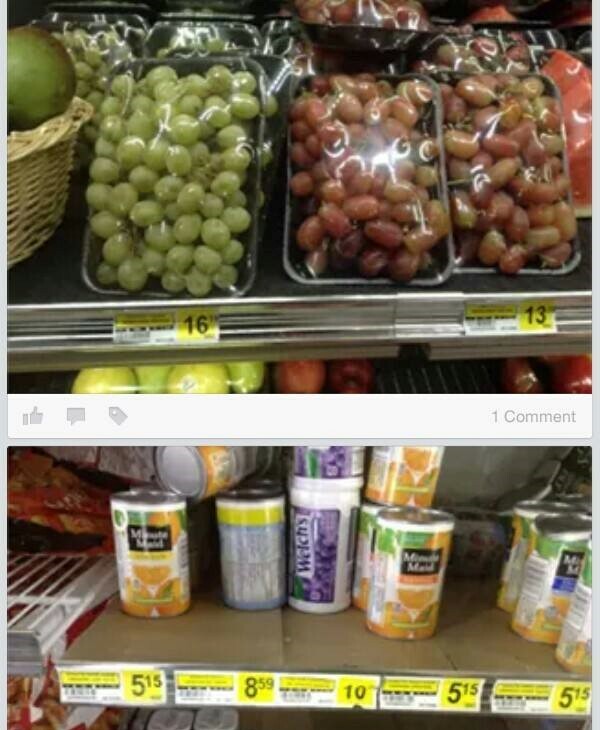 When Minute Maid concentrated orange juice is selling for $5.15, you know something is wrong with this picture. There are lots of northerners who are unable to feed themselves and their families due to the high cost of food in the north. We have heard a lot of mothers who are not eating so their children will eat and how 70% of people in Nunavut have experienced hunger at one time or another. There are some northerners that live meal to meal, or if they are lucky, they will have a meal that day. Some families resort to food that are stomach fillers (pasta, rice, hamburger meat – the cheapest meat) to have food in their stomachs, forget nutritional food because they do not have a lot to eat that day. Please help us raise awareness of the high cost of food in the north! Tell your family, friends and others. Write to your MP about what is happening in the north. If each one of you refuses to shop at any of the NWC’s stores on Saturday January 31, 2015 you will be helping us beat the high cost of food in the north. If even 50 people refuse to shop at each store, we will make a significant financial impact! Each and every one of us can make a difference, every little bit helps. Stand with us and help us make a difference because we can. We HAVE to! BOYCOTT! January 31st is a good day to BEGIN, but it doesn’t have to end there. Visit http://feedingmyfamily.org/ to learn more about the issues northern families face. Great answers to your questions about the opportunities and challenges, lifestyle and more. Use their contact form to ask questions. Join or START a community action group. They have sprung up all over the country in response to THIS Huffington Post Article and one woman’s determination. Email those in control of the North West Company. Decision makers need to know how you feel. VOTE October 19th, 2015. Choose a government that considers the needs of its people FIRST. This link will take you to the North West Company`s 3rd Quarter Financial Report published December 2014. Shareholders were rewarded with dividends and sales were up up up. In case you wish to communicate your concerns directly, here are email contacts for the President & CFO of the North West Company. They are the main food retailer in Canada’s northern communities. You can also read their 3rd quarter financial report to shareholders (dividends paid, sales up!) at the link below. Edward Kennedy, President and CEO, The North West Company Inc. Phone 204-934-1482; fax 204-934-1317; email ekennedy@northwest.ca John King, Chief Financial Officer, The North West Company Inc. Phone 204-934-1397; fax 204-934-1317; email jking@northwest.ca This information is publicly available on the web, for anyone wondering about the “fairness” of sharing the email addresses. Let them know what you think about their profits on the backs of northern families. Domestic Violence at Work | Canadian Labour Congress. Canadian employers lose $77.9 million annually due to the direct and indirect impacts of domestic violence, and the costs, to individuals, families and society, go far beyond that. However, we know very little about the scope and impacts of this problem in Canada. The Canadian Labour Congress partnered with researchers at the University of Western Ontario and conducted the first ever Canadian survey on domestic violence in the workplace. We did this because there is almost no data on this issue in Canada and we know that women with a history of domestic violence have a more disrupted work history, are consequently on lower personal incomes, have had to change jobs more often, and more often work in casual and part time roles than women without violence experiences. Being a perpetrator of domestic violence also significantly impacts a worker and their workplace. A recent study found that 53% of offenders felt their job performance was negatively impacted, 75% had a hard time concentrating on their work, and 19% reported causing or nearly causing workplace accidents due to their violent relationship. Their behaviours lead to a loss of paid and unpaid work time, a decrease in productivity, and safety hazards for their co-workers. A third (33.6%) of respondents reported ever experiencing domestic violence from an intimate partner, and there were differences by gender (figure 2). Aboriginal respondents, respondents with disabilities, and those indicating a sexual orientation other than heterosexual (e.g., lesbian, gay or bisexual) were particularly likely to have reported experiencing DV in their lifetime. In terms of indirect domestic violence experience, 35.4% of respondents reported having at least one co-worker who they believe is experiencing, or has previously experienced, domestic violence and 11.8% reported having at least one co-worker who they believe is being abusive, or has previously been abusive, toward his/her partner. Of those who reported DV experience, 38% indicated it impacted their ability to get to work (including being late, missing work, or both). In total, 8.5% of DV victims indicated they had lost their job because of it. Over half (53.5%) of those reporting DV experiences indicated that at least one type of abusive act occurred at or near the workplace. Of these, the most common were abusive phone calls or text messages (40.6%) and stalking or harassment near the workplace (20.5%; Figure 3). Ultimately, stronger evidence will help to shape legislation, policies, and practices that promote violence prevention and safety in workplaces, that hold abusers accountable for their behaviour, and that lift the burden from victims so they need not deal with domestic violence alone. violence from their employer. Among unionized respondents, 27.2% received information about domestic violence from their union. Only 10.6% of all respondents think that employers are aware when domestic violence is affecting their workers, but among those who said yes, 62.3% believe employers act in a positive way to help workers experiencing domestic violence. Similarly, only 11.3% of all respondents think union officials are aware when domestic violence is affecting members, and among them, 86.6% believe unions act in a positive way to help members. The Yukon Teachers’ Association has negotiated special leave that can be used when workers need time off due to domestic violence. The Canadian Union of Postal Workers (CUPW) has a network of social stewards who are provided training to develop listening skills, learn about available resources, and assist in prevention of a range of difficulties, including family-related problems. The program is particularly effective in Quebec. Download the entire report and learn more about what we are doing on this issue. 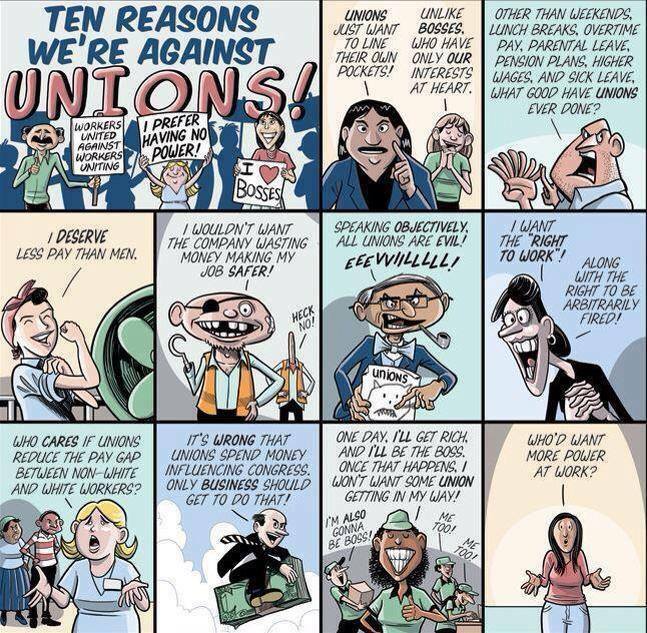 Ten reasons to be AGAINST UNIONS! To mark the first contributions made to the unemployment insurance fund more than 73 years ago (July 1, 1941), the Public Service Alliance of Canada launched today “Employment Insurance in Canada: Hitting Rock Bottom”, a short animated video on the decline of the EI program over the last 25 years. Please share! High-functioning Autism creates challenges for the public sector. CBC Reporter Julie Ireton’s report on the autism spectrum in the workforce. This interesting article highlights the challenges faced both by workers impacted with ASD and the challenges of creating work spaces best suited to their needs and skills. Accommodation and understanding will go a long way toward ensuring workplace diversity reflects the strengths of all workers. The question of whether self identification will empower or hamstring workers is worthy of further discussion. How Hassan Yussuff won the CLC presidency | rabble.ca.